The set of services provided by a specific back-end server is called a 'solution' inside our transaction manager: when a developer first defines a solution to run through our cloud-based time-limited transaction manager, a solution token is created. 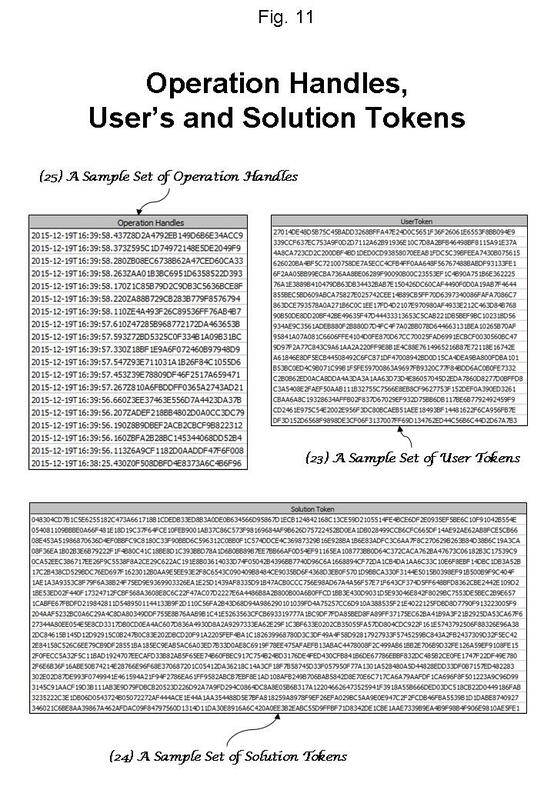 As depicted on Figure 11, solution tokens are represented by strings of one hundred and twenty eight random hexadecimal digits, corresponding to 512 random bits. As is the case with the vast majority of concepts on our cloud-based time-limited transaction manager, solutions can be defined to be valid since and until a certain moment in time. In order to query or modify these two timestamps for a solution, the APIs 'SolutionSinceGet', 'SolutionSinceSetAllow', 'SolutionSinceSetCommit', 'SolutionUntilGet', 'SolutionUntilSetAllow' and 'SolutionUntilSetCommit' are available. As in the case of user tokens, this first solution token generated (which we call a master solution token) is requested for sensitive operations on solutions. For example, to define each individual operation of the set of services provided by the back-end server, the master solution token must be passed in to certify that the caller is the real owner of the solution. Normally, this owner will correspond to the development team's manager responsible for the project. Other team members might not be need to change the set of operations of the solution, but might need to call them: think, for example, of programmers developing the front-end software. To handle this requirement, our cloud-based middleware server is able to generate a variety of solution token clones (or copies), which can then be used to certify specific roles that are part of the development team: for example, clone solution tokens are enough to run specific back-end services through time-limited transactions, but not to define them; translation solution tokens can be given out to team members responsible for translating a solution's messages (shown to users and internal documentation), who will never need to call one of the solution's methods; and a query solution token is required to audit the solution's transactions run on our cloud-based time-limited transaction manager. In any case, the name of a solution can be retrieved based on any solution token by calling the 'SolutionNameFromTokenGet' API.